SunVenture Cruises and its parent company SunQuest Cruises have been providing unforgettable experiences on the water for over 15 years with a variety of cruises in the Destin Fl area. From elegant Destin wedding venues to fun Crab Island cruises, SunQuest Cruises offers a multitude of unforgettable experiences on the water with cruises in Destin and Okaloosa Island for all occasions and groups. 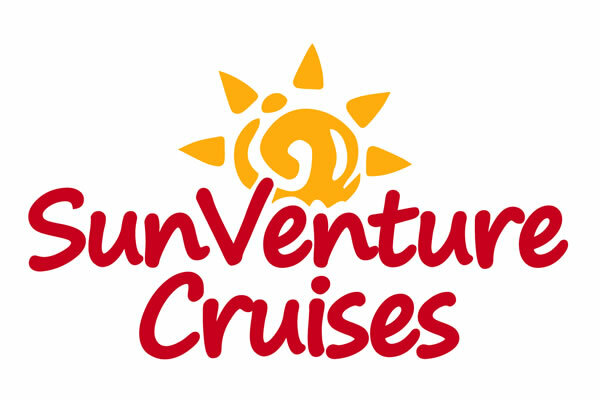 A new ad’venture’, SunVenture Cruises joined the SunQuest Cruises family in 2012 as a leisure cruise option in the heart of the Destin Harbor. For 7 years, SunVenture Cruises has provided convenient cruise options for Sunset Dolphin Cruises, Destin Harbor Fireworks Cruises and Crab Island excursions, one of Destin Florida’s top attractions. In 2019, SunVenture Cruises is expanding to offer leisure cruise options from Okaloosa Island, one of the only services available in that area. A more affordable option than Okaloosa Island boat rentals, SunVenture Cruises offers daily Crab Island, Fireworks Sunset and Sunset Dolphin cruises chartered by our captain. The Okaloosa Island location is only five miles from our Destin Harbor location, giving guests two convenient options for cruises in Destin Fl and capacity for up to 98 guests for private cruises. The SunVenture II is located at Dock on the Island, located on Okaloosa Island across from The Island Hotel by RL. SunVenture’s captains make safety and stellar customer service top priorities on all cruises. Based on testimonials alone, SunVenture Cruises has been awarded the “People Love Us on Yelp” award as well as Tripadvisor’s Certificate of Excellence award for 2017 -2018. Our customer testimonials center around our entertaining and helpful captains, unforgettable Destin cruise experiences and our great customer service. The custom built SunVenture I is a water lover’s 45 foot sporty catamaran. The SunVenture features a state-of-the-art sound system, an open air deck, on-board restroom and a fold down ladder so guests can easily plunge into the pristine, waist-deep waters of Crab Island. Be prepared to be entertained and educated! Our captains will share their intimate knowledge of Destin Florida on all the narrated cruises as passengers explore the sparkling waters and interact with sea life like dolphins, crabs and birds. Families who live and visit the area and wonder what to do in Destin beyond the beach can enjoy the local waters with relaxing and educational SunVenture dolphin cruises in Destin, experience an unbelievable Destin sunset cruise or enjoy a Crab Island Destin Cruise excursion. The SunVenture’s 1 1/2 hour dolphin & sunset cruise in Destin lets guests experience the closest view of the dolphins on the sparkling Emerald Coast waters and other sea life such as sting rays and birds. Passengers will also have the best seat in the house for an unparalleled Destin sunset cruise as the sun sets over another day in paradise. Only accessible by water, Crab Island is the most authentic Emerald Coast experience with panoramic views of the Destin Harbor and Destin bridge. Enjoy a worry-free day as our Coast Guard-licensed captain drives the boat for our Crab Island cruises. Once the SunVenture drops anchor during your 3 or 4-hour narrated Destin cruise, guests can jump into the waist-deep, pristine waters of Crab Island to play, mingle and relax. Enjoy the inflatable water park, food vendors, kayaking and more (additional cost for activities). 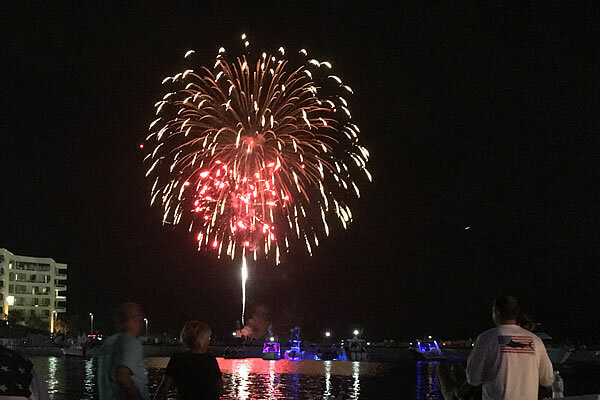 You can enjoy the best of both worlds on our weekly Sunset, Dolphin and Fireworks Destin Harbor Cruises. Cruising each Thursday in the summer, this 2 hour evening cruise explores the majestic area around the Destin Harbor as the sun sets over the iconic Destin bridge and dolphins play in the horizon. As the sun sets, the sky illuminates with fireworks from Emerald Grande and Harborwalk Village. You get the best view in the house of the Destin fireworks from your private seat on the SunVenture. The state-of-the-art sound system and open deck on both catamarans make it an ideal venue for any private cruise, Destin boat rental and/or event in Destin. Hosting up to 98 people altogether, the SunVenture catamarans are great for relaxing in the sun at Crab Island in Destin or dancing under the stars as your own private Destin party boat. Perfect Destin cruise for a Destin bachelorette / bachelor celebration, corporate events/retreats, birthday / anniversary celebrations, brunches and more. You also get access to our full-time Destin event planners who are experienced and creative in helping you customize your private event. SunQuest Cruises specializes in unforgettable memories on the water for all occasions – engagements, holidays, Destin weddings, meetings or simply a memorable dinner. Celebrating its 15th successful year of business, SunQuest Cruises is a locally owned and operated company in the Destin Florida area. Owner James Murray and his entire team are hands-on throughout the daily operations of dinner cruises, Destin Florida weddings, group cruises and meetings. Our team consists of experienced wedding planners, chefs and serving staff who make customer service their number one priority. SunQuest Cruises have been recognized as one of the top seafood restaurants in Destin Florida based on reviews from Tripadvisor as well as one of the top things to do in Sandestin Florida. We have also been recognized as one of the best Destin wedding venues in the area. Our client reviews have earned us the Knot’s Best of Weddings award for the past 9 consecutive years as well as the Knot’s Weddings Hall of Fame and WeddingWire’s Couples’ Choice awards. The SOLARIS is a custom-built, 125’ dining and entertainment yacht boasting three decks of indoor and outdoor spaces. Rated as one of the top things to do in Destin, SOLARIS dinner and dancing cruises are scheduled weekly and year-round. SOLARIS dinner and dancing cruises are catered to everyone – whether it’s a delicious meal for two on our public sunset dinner and dancing cruises or an elaborate Destin wedding out at sea.The SOLARIS yacht is docked at the Sandestin Golf and Beach Resort, offering guests a convenient and all-inclusive experience with accommodations and transportation available just steps away from the yacht. SunQuest Cruises’ team goes above and beyond to make every guest’s experience amazing and unforgettable. From birthday and anniversary packages to all-inclusive Destin wedding packages to inspiring meeting spaces, SunQuest Cruises offers flexible and creative options for any occasion. We can configure the weather-proof SOLARIS yacht venue to any arrangement on one or all three of the decks. Enjoy an all-inclusive experience as our team can handle all of your event / wedding planning, custom decor, creative flowers, catering, entertainment and rental needs. We can even assist with Destin Beach Weddings and off–site catering. Our award-winning wedding and event planners are local experts who have been planning events in the Destin area for over 17 years. SunQuest Cruises has built relationships with reputable local businesses to offer our guests the best event experience. We have planned hundreds of meetings, group events, Destin yacht weddings and Destin beach weddings with people as far away as the other side of the country. Our team is known for being readily available, having an intrinsic attention to detail, being flexible, planning for the unexpected, maximizing budgets and going above and beyond.